The outrage culture that social media platforms like Twitter, Facebook and Instagram produce makes its users both the judges and the defendants. They are subject to the intense scrutiny of others while simultaneously dishing it out themselves. The nature of these platforms allows the users to react instantly and emotionally without thinking of the ramifications and consequences of their words. This results in people saying incredibly harsh and outlandish things they otherwise would not say in real life. It truly brings out the primal side in all of us. There is, of course, nuance to this issue. The public should hold certain people like our elected officials accountable for their actions. But, when the said action is an off-color tweet or comment from 2012, then the public outrage seems a little ridiculous. The internet makes it especially easy to dig up the lard of someone’s social media pages — especially those in the public eye. Past tweets and posts never go away and are a permanent mark on the individual, a “black stain” on the soul. They become unredeemable and are condemned and punished harshly in the public. If we are expecting our politicians and celebrities to be perfect, then should we expect the same for ourselves? If we police our celebrities, then would it make sense to scrutinize every word our peers say? Being so quick to judge someone leaves us vulnerable to that same judgment. As a result, many people take half-baked information without context and display it to the public without getting the full story. This is especially evident with journalists and left-leaning celebrities who wish to virtue-signal to their followers for a nice pat on the back. Among the plethora of recent examples of this phenomena, the Covington Catholic High School incident rings loud in this period of political polarization. The narrative was that the standoff between Covington Catholic student Nick Sandmann and Omaha elder Nathan Phillips was indicative of how racist, Christian and conservative youth were being brought up in America. But, with a few minutes of research, this story was simply not true. When the full video of what transpired was released, it was revealed that the Black Hebrew Israelites approached the students and began calling them derogatory names. Throughout the video, the students did not chant “build the wall” like many media outlets claim, but rather school spirit chants that they often used during games. The media twisted the story to make it out that these boys were instigating the Native Americans when in reality the truth lies somewhere in the middle. 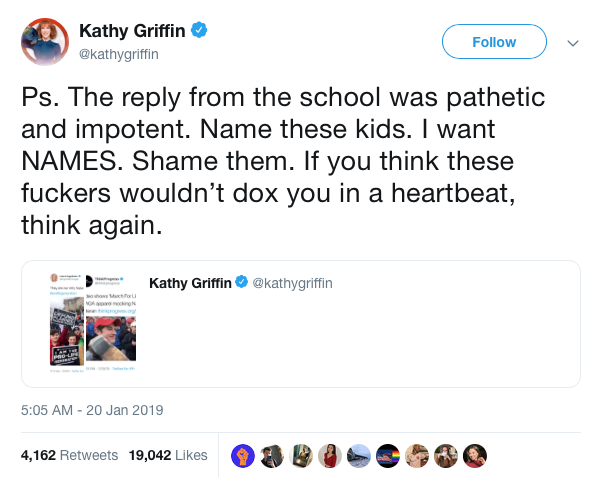 The Covington Catholic students were wildly and disgustingly mischaracterized as products of the “hate factory” and “segregation-era racism,” and celebrities calling for the dox and even murder of these children is absolutely despicable. When new details were revealed, the media was slow to correct its errors and celebrities were even slower to correct themselves, if at all. The enticing temptation of the outrage the story potentially presented caused journalists to not do their jobs and for celebrities to react carelessly, only to seem foolish when the truth came out, and they are slowly receiving the consequences of their impulsivity. As the negative effects of social media and the hive-mind mentality it fosters is coming to light, it seems that the outrage has begun bubbling to a boiling point. Where do we draw the line? Would it be when people begin to take their own lives? That certainly has not stopped them in the past. People should be more careful with what they post, yes, but other users should exercise restraint and caution when browsing. Thus, it brings to us the age-old lesson: Think before you speak. There is no incessant need to comment on events as they are happening. Take the time to research and look into an issue before making a judgment. Healthy skepticism never hurt anyone. Giana Castelli is a School of Arts and Sciences junior majoring in political science. Her column, "Conservative Across the Aisle," runs on alternate Fridays.